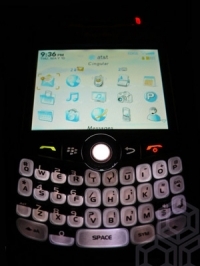 John Mayer's Blackberry Curve | BlackBerry Blast! It looks like singer John Mayer likes his gadgets. He seems to be moonlighting as a gadget blogger. He got his hands on a Blackberry Curve and has posted a couple pics on the blog. Way to go Johnny!